Wife and Mom of 2. Wine Drinker. Coffee Lover. Workout enthusiast. Things have changed for me the last few months. Outside of working on my Master’s degree the last 1.5 years, the time I can commit to Beachbody is limited. And when the limited time is available, I don’t want to do it. My whole being rejects it. Each time I’ve had a break from school work, I’ve thought “I’m going to reignite my coaching and get it built up so when school starts up, I’ll be set and sailing smoothly.” I’d get up at 5am, workout for 30 minutes then spend 45 minutes trying to figure out how to take the better selfie so I looked 1) thinner; 2) energetic and 3) pumped that I’m doing workouts at 5am. It doesn’t make sense. And then I’d post to Instagram, Facebook and Twitter and get zero hits. Yea, hard work and hustle pays off down the road, but doing this for months on end and getting nowhere starts to become burdensome and unexciting. I don’t want to spend my life tied to social media. I don’t want people to know when I’m leaving my house for vacation with my family or working out or at the grocery store or how amazing my ordinary life is because I have children and am 100% a mom to them. 80% of my Facebook friends are parents, they have awesome ordinary lives too. I also find, over time, that social media has a way of making people feel less about themselves. In the way of “Oh… look how happy and amazing she is doing and succeeding and I’m just sitting here like ‘I’m out of wine and my kids are crazy today.’ But she has make-up on and looks awesome in her faux workout gear… and I’m a slob with hair that’s been in a ponytail for 3 days straight.” I’ve set Facebook aside so many times and felt instantly bad about myself and my lack of success. Did I fully put my heart and soul into being a Beachbody Coach? No. You know why? Because it isn’t my heart and soul. My kids are my heart and soul, and so is my husband. It means more to me to be available to the three of them than to be available to someone who wants my time but doesn’t want to commit to doing the work. It sounds harsh and it sounds rude, but really, it’s an investment of time. You have to know where you’re willing to invest that time. It’s also an investment of money… Oh yea, you have to spend money in order to stay active. If you’re not selling $55+/mth to earn points, you become inactive. And there’s the whole pyramid scheme part of it (yes it is multi-level marketing [MLM] but it’s also a pyramid), success club, how to get coaches, etc… The best way to stay active and to show people you’re serious is to show everyone (daily) that you drink your Shakeology, which runs you a sweet $100/mth (+/- tax/shipping). Oh, and a $17/mth coaching fee you pay so you can be a coach. That’s $1400+/- a year out of your pocket so you can be an active coach. Now if you get 3 people to be on Shakeology home direct each month, that’s $99/mth in your pocket, so sort of like covering your cost of Shakeology. But you really need 4 people because that’s $132/mth and that covers your Shakeology, coaching fee and then actually gives you a profit. But if any of them are signed up for club, you get less back from them (15% back instead of 25% back). So if all 4 of those people are signed up for Club and Shakeology HD, you’re back to $80/mth from 4 customers, and you’ll need a 6th to cover your coach fee/Shakeology costs and make $3 profit. But now everything is changing to Beachbody on Demand, so good luck with that. The goal really isn’t to get people to buy the workouts (because that’s just a one-time cost)… the goal is to get them set-up on Home Direct orders (Shakeology or Performance Line). Let me add a disclaimer here: If Shakeology is your jam, that’s awesome. I’m happy for you. If it’s giving you the results you wanted it to, even better. Get after it!! Now, if you’re reading this thinking “I want to be a Beachbody Coach…” let me give you (few) words of advice… FIND A GOOD UPLINE/SPONSOR COACH!!! Just because your friend is asking you to join doesn’t mean they are the best FIT with your goals for the company. They want to rank advance and you’re in the spot to help them. If you want to actually WORK the business, I’d start searching for Top Coaches and feeling out which one seems to vibe more with your life/goals/desires for what you could be with Beachbody. You want people who will inspire you, work with you and guide you as much as they can. Yes, a lot of this you will do on your own and you will have to rely on you and your work ethic to rank advance. It does help having a supportive upline, with good training and team goals and someone who can guide you. It also helps to have someone who understands that you don’t want to be on a 10:30 PM EST call because you’re usually in bed and get up at 4:30 AM to workout every day. And yes, I stood my ground and never joined the call, which showed (to them) I wasn’t serious about succeeding… but to me, it was more important to sleep and get up at 4:30 to work out than it was to listen to someone talk. I respect your time/availability, and I ask that my time/availability is respected as well. Also, remember to be a product of the product (if you’re going to sell). Do the workouts and live/breath/drink Shakeology. And then post it all over social media that you worked out today. As for the workouts, I do believe in them. I think the really hard ones (any Insanity, T25, P90X-series, and Body Beast) are well worth the investment and time commitment to complete them. I think they’re great guides to getting you into a fitness routine if you’re not currently in one and you’ll see actual results if you follow the calendar and have a healthy diet. 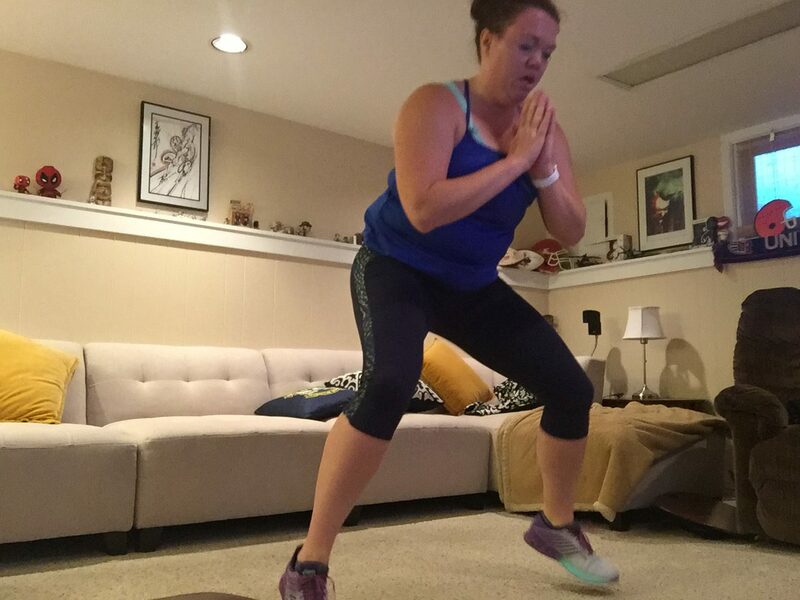 Shaun T is the only trainer I could handle day after day and it always felt like he was in my living room helping me do the best I could do each morning. In the end, I was only doing Insanity or Insanity Max:30. They were the level I needed and the hardest. I thank Insanity and T25 ALL THE TIME when I’m out running or trying a new physical activity and have core strength or proper form, or can do more than I could a couple months ago. They laid a base foundation for me to be able to go out and run Warrior Dashes and now join Crossfit. I now have zero desire to tell anyone where I’m working out or what I’m doing. I feel like I’m taking it back as a personal commitment to myself and not a commitment to the world. If I want to do this for me, it has to be FOR ME. If I can motivate and inspire along the way, I will. I just don’t want to use my social media as a platform for an MLM job anymore. In the end, if you’re interested in giving it a shot, go for it. Keep in mind it takes a lot of hard work, it takes hustle, and it takes time. Know in advance where you’re willing to commit your time and if you have the money to invest (read above) go for it. Lots of thoughts have been passing through the last month or so. Lots of “What do I want to do with my life?” and “What is my passion?” and “I used to have a why, now I don’t have a why… what’s my ‘why’ for why I do what I do?” I don’t know. I don’t have the answers right now. I just know some areas are slowing and some areas are growing. Life is handing me a lemon and I need to figure out how to make it into lemonade. I’m the type of person who sees a goal and can envision the light at the end of the tunnel, but I never know how to get from initial vision to light. So here’s to spending some time figuring out the next steps and re-aligning my priorities to what’s important, what goals I want to accomplish and where I need to put my focus. Man, I really kept up with that daily post on telling everyone how well I was doing during my Round 2 of Month 1 Insanity. Phew… 2 days in and that was it. The reality is, I wanted to keep up, but then every morning when I’d get to my “blog writing time,” I’d sit here and go “Really? is this exciting and inspiring?” There’s a bunch of other people who have already documented their daily walk through of Insanity, why am I trying to re-create the wheel? At the beginning of August, I did Dr. Mark Hyman’s 10-Day Detox Diet. It was awesome. It re-ignited my desire to eat healthier and I’ve pretty much kept up with the same way of eating, minus adding a few things in like coffee and avocado’s and a couple glasses of wine on Friday or Saturday night. The detox eliminates all sugar, dairy, caffeine, soy and alcohol from your diet for 10 days. I lost 8lbs! AND the best part is, I wasn’t starving myself. Yes, I got tired of cooking and eating a salad at lunch everyday. The more I did it, the more I was able to get around the lack of desire to cook. Since I completed it, I’ve kept up with my chicken breast and salad w/ veggies and balsamic vinegar for lunch – except this week. I didn’t hit the grocery Sunday and still haven’t. My goal is to continue on with this, and get back to following the plan on a more 80/20 or 85/15 level. I honestly do feel good after going through it, and it helps that I see the results on the scale. I know the scale doesn’t always matter, but there are times it does. I think it quits mattering when you’re within your goal body/weight. I’m not there yet. And even though I haven’t yet moved into Insanity Month 2, I think I’m going to move into Insanity Max:30 instead. I loved Insanity Month 2, but right now, I need to focus on shorter workouts so I can be ready by 7:30 to walk my daughter to her bus stop. I actually got myself out of bed at 5am today! AND I was in bed at 9:40 last night and lights out a 10pm! That’s a miracle. I can’t stay up past 10 if I want to get out of bed at 4:30. When I turned the light off last night, I told myself I was only allowed to snooze my alarm clock 3x and had to have feet on the ground at 5am. So up at 5am, I was. Had my Energize and grabbed my water with a Nuun tablet and headed to the basement to do two things; 1) wait for the Energize to kick in and 2) give myself time to wake up a little more. Pushed play around 5:45… I usually look, or maybe it’s just how I feel, like a fish out of water during the first 2 sets of the warm-up, and then suddenly during the 3rd set, I’m all into it and gung ho and sweating. And then Shaun T slows it down for 7 minutes of stretching. WTF? So I did my 8-counts per stretch and moved through it. Shaved off 2-minutes of the total time. Of course, I didn’t realize I was fast forwarding right into power jumps, belt kicks, hit the floor, and V push-ups. I probably would’ve enjoyed a 2-minute break had I remembered this. —> this is pretty much what I did during the rest periods. 3 full rounds of these same exercises. Then he throws in some tricep dips and ball push-ups at the very end, because I’m not tired or anything. Second group of workouts – hurdle jumps, globe jumps, moving push-ups, and plank runs. I actually like this group of exercises, but I’m so beat by the time I get here I just don’t want to keep going. Often throughout he’ll say “If you don’t look like this, you need to take a break.” I’d be taking a break for 40 minutes if that was true. Last bonus exercise? 8 squat hops, 8 push-ups. Who doesn’t love that at the end. 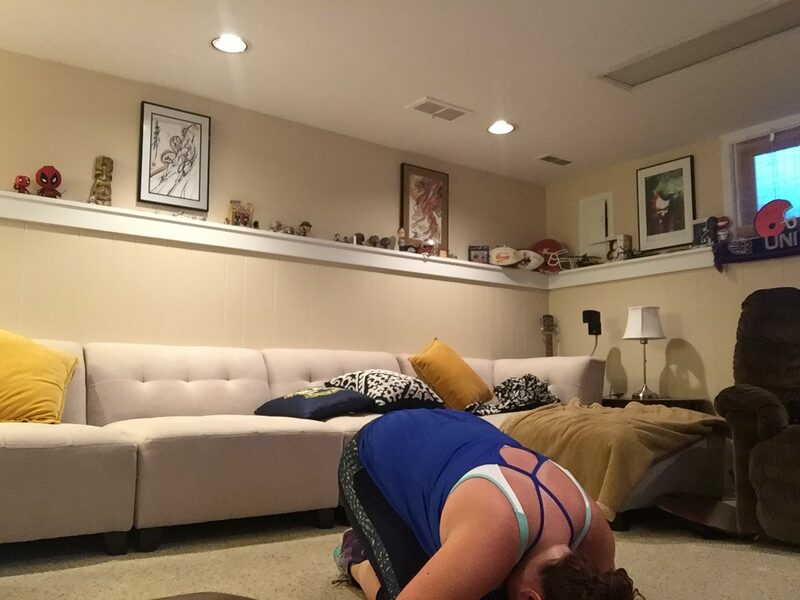 And then at the end, I get to do this… until Shaun yells at me to get up and stretch. Then I sat (on a tile floor) and let the sweat drip from me. Tomorrow is supposed to be my “Cardio Recovery” day, but I’ve been challenged to do something this week I don’t normally do. I’ll most likely skip the Cardio Recovery and go for a walk/run in the morning instead. Where have I been? What have I been up to? It’s been since October 2015 since my last blog. Back in May (this year) I said “I’ll blog my progress every day.” I didn’t. I’ve been in school working on my Master’s degree. I thought, no it won’t take up much of my time. It seems like every other 8-week term it’s taken my life. I can’t juggle all the balls I have in the air, so my love of being a Beachbody Coach has been put to the back burner while I go through school. To get to the matter at hand… Insanity, Round 2!!! YES! I said it, Round 2!!! I never thought I could complete this program, but I did. So how did Round 1 go? Eh… I kind of half-assed Month 1 and then something clicked in Month 2. Did I workout 6 days a week? No. I tended to skip the Recovery days and rested Sunday’s, sometimes Saturdays. BUT something clicked in Month 2 and I did pretty much 5-6 days a week of Insanity for most of the 4 weeks. So I decided to start Round 2 after a week off in between finishing Round 1. So — Month One, Day One/Two… what does that even mean? It means I skip the Fit Test and do Day 2 of the program. I know, I know… follow the calendar, Jenn. I do follow it, but quite honestly, I don’t care about the Fit Test. I don’t care if I can do only 10 power jumps and 15 power jumps in 2 weeks. I feel it. Through Month 1 and Month 2 I noticed the strength in my upper back, shoulders and arms and core when I didn’t have to always modify push-ups. I can do real (ok, I go about half way down) push-ups. That is MY fit test. The Warm-Up — so one would think “Shoot, I’ve done this before. 40 minutes is NOTHING after 4 weeks of 60 minute workouts. I’ve got this.” Yea, F that… I went right back to “I think I’m going to die!” during the warm-up. 3 Rounds of the warm-up, then stretching. Knowing the format of the stretches, I move through them faster than the workout does. While he’s talking form, I’m moving into a different stretch, giving myself a 4-to-8 count through all stretching moves. I shaved off about 1-minute doing this because I added a stretch in somewhere. The Workout — here is the CORE of the work. 20-25 minutes of hard, intense exercise. I love it. 2 Rounds of 3-sets of HIIT moves. Each set has 4 different moves you do for 45-60 secs, and then a 30 sec break. The last set will add on 1-3 “bonus” type moves. These are the moments you’re calling him a total jagoff because you think you’re already dying and then he adds 3-minutes onto your last set. How many times is this guy going to tell me to check my heart rate in the middle of jumping around? 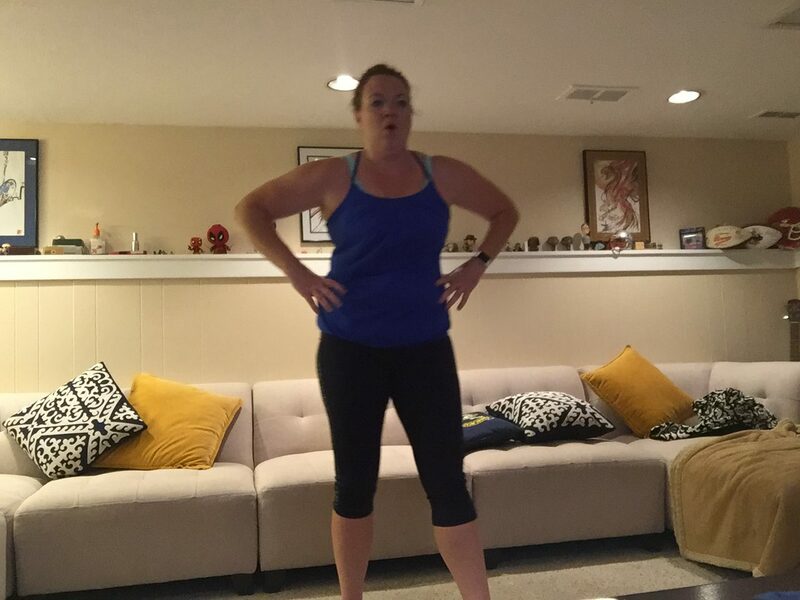 Doing Power Jumps and in the middle of it Shaun T is saying “check your heart rate! !” It’s high, I feel it, it’s beating out of my chest and I can’t breath. I don’t need to stop and check my heart rate, pal. The Cool down — Amazing stretching. What am I eating these days? I’ve re-joined Weight Watchers. Yes, ha, I’m a Beachbody Coach and they have those awesome colored containers for portion control. For me, it’s too much stress to add onto my already stressed shoulders. Weight Watchers takes away the guess work. I’m still Gluten Free 98% of the time. I’m Dairy Free like 20% of the time, although I should up it to like 90%. I’m Egg Free probably 50% of the time. I don’t eat them regularly like I used to, but I don’t always avoid things I know might have them. Shakeology – while I believe fully in the product and even the price behind it, right now I don’t have it as regularly as I was. When I do, it’s only Chocolate Vegan. I probably have it 2-3x a week at the moment. It’s not that I’m avoiding it or lost my belief in the health benefits, it’s more I need to avoid sugars for awhile to continue healing my gut. Once I’m healed, I’ll bring more Shakeology back into my diet. 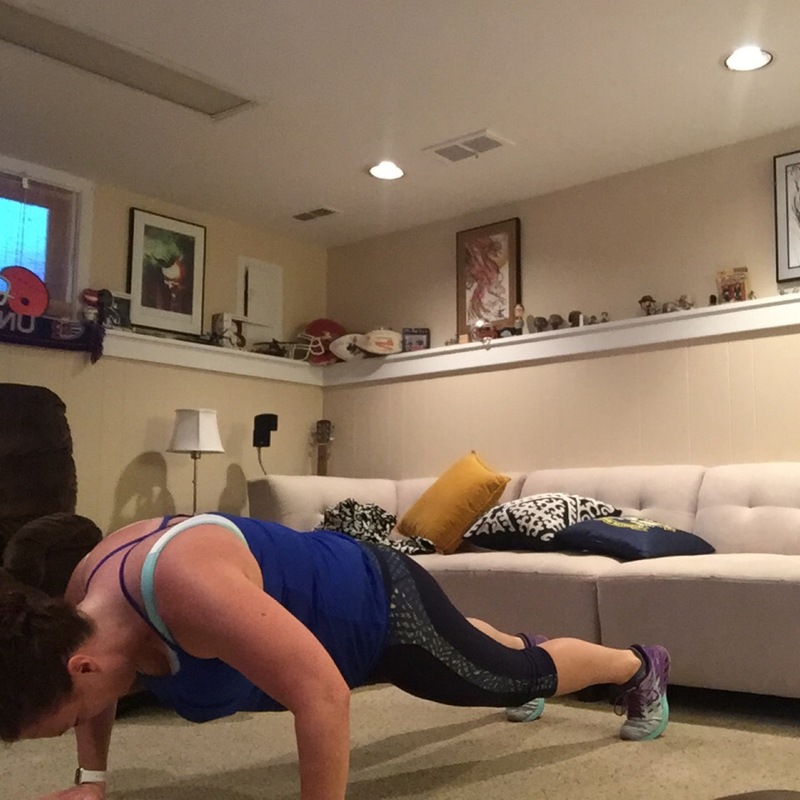 When I workout – I always take Beachbody Performance Energize to wake me up and pretty much force that 5:30am workout. Earlier was my post about change in my diet to gluten free and dairy free... a couple hours later, after talking to my Soul Sister, D, I realized, while that post is truthful and factual, it’s not the reality. I then say “I can eat here and here” and my husband lovingly says “okay, I’ll eat anywhere.” or “but you could get a piece of grilled chicken from Chik-Fil-A…” What’s the point if I can’t have bread or cheese? I’m not even 100% certain I can eat half the stuff I eat because I do not know if there is dairy in it. I’m slowly hating eating out but I’m not all up in arms excited about cooking 21 meals every single – math: breakfast, lunch & dinner 7/days a week. Robin Sharma isn’t joking around with that quote. Change… it’s hard to accept and move with when you’re not ready for the change. There are times change is needed, I know it deep inside, but refuse to get out of my own way and do what is needed. Two weeks ago, I received blood work back showing I have either a sensitivity or allergy towards whey, wheat and casein (dairy). I mean, really… all three? Why all three? It’s like someone is sitting up there going “Look, I’m going to force you to eat meat, vegetables and fruit and only meat, vegetables and fruit. This is what it’s going to take.” Well, thanks. In two weeks I’ve done more research on what bad foods I can eat because the good foods are pretty easy to figure out – fresh produce and meat. But what about ice cream? And chocolate? What do I turn to when I have a sweet craving and can’t eat my normal dark chocolate or milk chocolate? It’s a whole new path for me to follow. The morning I saw the results, I immediately made the changes I needed to make. There have been a few times in 2 weeks where I popped something in my mouth and then later realized it had dairy in it — I realized it when 30 minutes later I needed a nap and hadn’t felt that way prior. 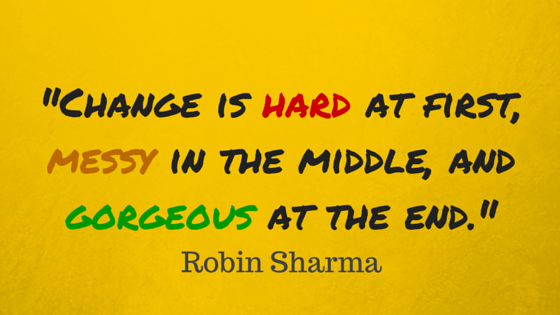 I’m still in the first phase of “change” – with it being hard. It’s getting a little bit easier, maybe I’m in the mix of hard and messy, I don’t know. I know I’m trying hard to let go of old habits. I know I also want to take a baseball bat and start swinging at all the food on the shelves. The things I want but can no longer have. The only thing making this somewhat easy is knowing the results came back high. Whether or not it’s a sensitivity or an allergy, I’ll treat it like an allergy, it’s easier that way. It’s how I treat eating seeds/nuts, I have issues with digesting them, I’m not allergic to them but i treat it as if I am. The thing I keep in mind is the end result of how I feel is not worth the temporary satisfaction of the taste in my mouth. I’ve said goodbye to a couple items I love the past two weeks. Beer has been replaced by wine, gluten free beer and gluten free ciders. I’m taking this opportunity to be a gluten free beer taster (on my own accord) and I’ll try anything once. Chocolate – finding a dairy free, wheat free chocolate is hard. I’ve decided to look instead for treats which are DF/GF, just so I can have a running of list of something to satisfy a sweet craving, but as a few and farther between type of treat. Bread/Pasta: I think there is GF pasta, but I have to be certain it’s DF too. Bread, I’m determining the value of GF/DF bread is probably not worth the cost. Plus, whatever is on the shelves looks disgusting, and what’s frozen is just too pricey for me. Cheese… this is when I long for the casein to be more of an “intolerance” than an “allergy.” To take away chocolate and cheese is like a punch in the gut. I tried the DF cheese last week. I also put it in my mouth, and then let it fall out of my mouth onto my desk at work because it was disgusting. Onward and upward to a new adventure in my quest for a healthy life. Though somewhat forced upon me, it’ll help me be a healthier version of me, as well as be able to instill eating healthy into my children as they grow up. I feel like they get to make out in this too… Pizza night with dad, while mom drinks Shakeology or make chicken and vegetables. Donut trip with dad, while mom eats GF oatmeal. So if you’re Gluten Free and/or Dairy Free – please leave me some tips in the comments section below. I’ll take any and everything I can get. I’m a sponge of information for this right now. Last week (on my Facebook page) I mentioned barriers from a Shaun T podcast I listened to. Well, this week I listened to his second new podcast and he discussed barriers and climbing over a wall. I liked his analogy. I complained a lot at this years Warrior Dash. Every single obstacle I had a complaint and the first thing out of my mouth was “I’m not doing that.” I hadn’t been running and I hadn’t been doing any strength training workouts either. I felt weak and crappy from the minute I saw the first obstacle until the Bloody Mary I had a couple hours after the race. How would I FEEL if I didn’t do ALL the obstacles? I know how I felt after I completed every single obstacle. I know how I sounded with the whining and complaining. I hate whiners and complainers and here I was putting myself into the category. BUT – in the end, I finished and I did every obstacle they put in my way. I didn’t walk around it, I didn’t make excuses for them. I may have whined and complained before I got to it, I may have said I’m not doing that but I did it. I DID IT. I climbed a wall, I swam through mud, I jumped over fire, I jumped in a lake and pulled myself up on whatever that thing was, I climbed through a rope tunnel and wondered why the hell did I sign up for this race again? It’s the same with workouts. Whatever workout you choose to do. 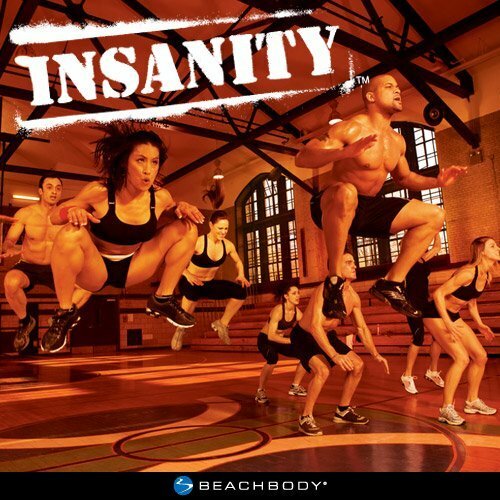 If you’re following one of the Insanity programs, did you quit 5 minutes into it? It doesn’t matter if you wanted to quit, I think even the person in the most awesomeness of shape wants to quit 5 minutes in to jumping hell. Did you quit? Did you decide on day 2 you were done, and then proceeded to get jealous and upset over the other people who continued to the program and saw results? How did this affect you? Did you decide you’re going to run a 5k or a half marathon only to quit training because it go too hard? At the end of the day, you have to do for you. You have to. No one else is going to do it for you. You can walk around the obstacles and choose to look back and see the people who got over the wall or you can climb up the wall yourself and know the struggle people had, if they received help getting over the wall and how they felt when their feet finally touched the ground and the pride they had for themselves for accomplishing a goal. How do YOU feel when you don’t complete something? Hey guys! I put together a video of me talking about how to select the right workout for you. Hope you like it!